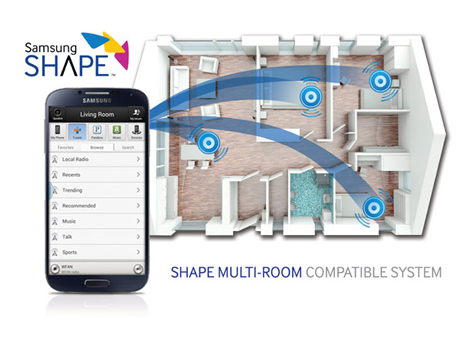 The Samsung Blu-ray™ Player easily integrates into your SHAPE™ Muti-Room System. 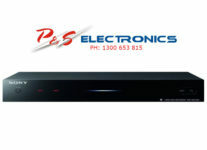 Enjoy your movies, TV and music wirelessly with rich, multi-room sound and no cluttering cords. 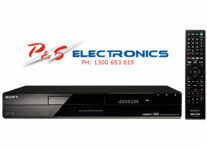 Pop in a CD and hear its incredible sound on any compatible speaker in your home. 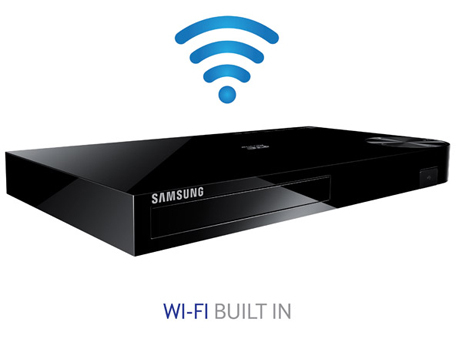 With Built in Wi-Fi, you can access all your Smart Blu-ray™ features and apps wirelessly. 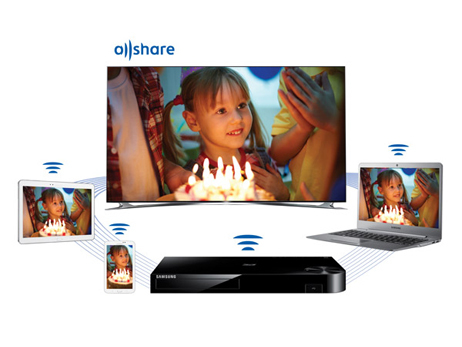 Sync and stream content to other devices as well, such as PCs, smartphones, tablets and cameras using Samsung AllShare™. 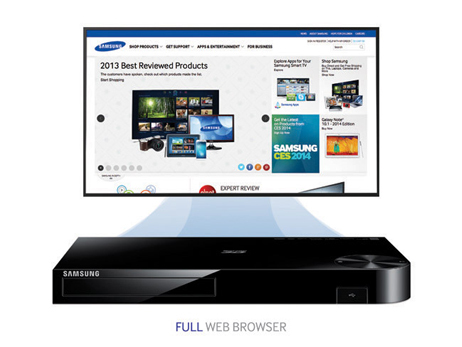 Browse all your favorite sites right there on the big screen. Access movies and TV shows, download apps, shop online, search the web, update your status on Facebook® and Twitter™ and more. Share your favorite movies, photos and videos from your computer or mobile device to your TV, using the Smart Blu-ray Player. 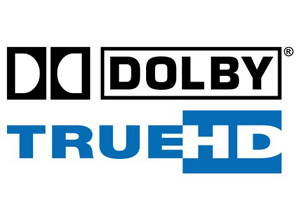 Your Bluray ™ player can access a video from your computer and play it on your TV so you can enjoy it on a bigger screen. 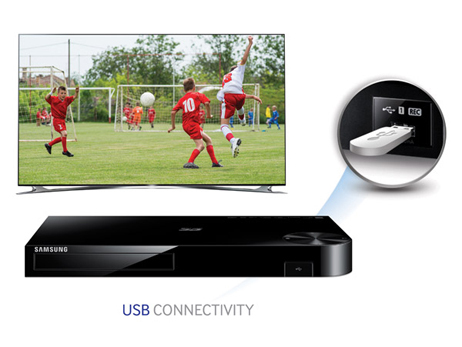 Enjoy your own videos, music and photos by connecting your external storage device directly to your Blu-ray player via USB. 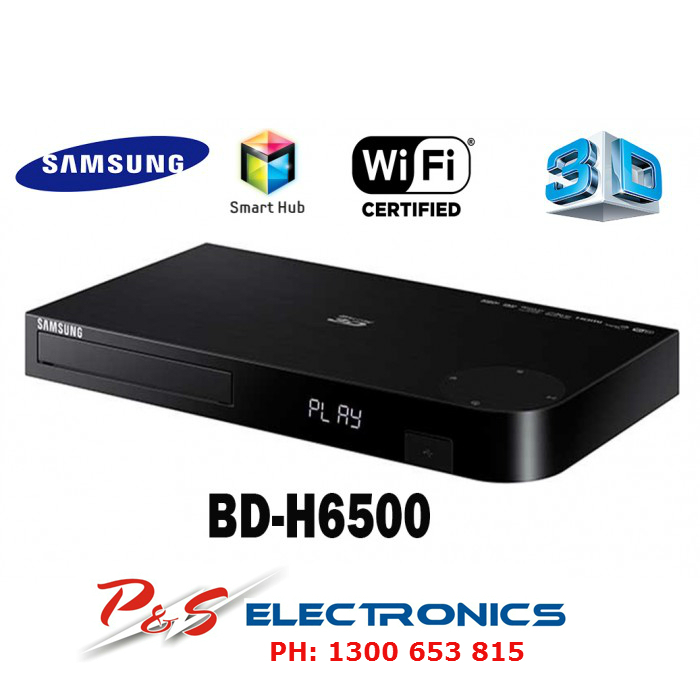 Just plug in your USB drive and access your personal entertainment library, in addition to all the great content you have access to in the Smart Hub. 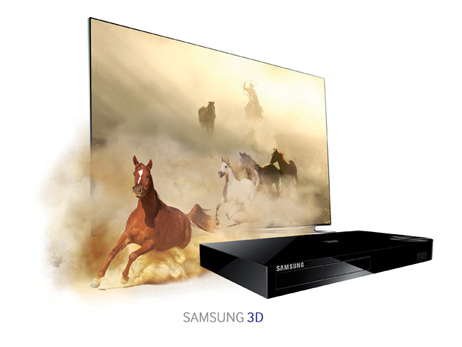 Upscale your favorite non-4K videos and films and enjoy them in Ultra-HD with Samsung Smart Blu-ray™ Player and Samsung Ultra-HD TV. Samsung UHD’s 4K resolution is four times the resolution of 1080p HD so you’ll see your favorite scenes with detail and clarity like never before. Discover your new favorite TV show, movie or app. 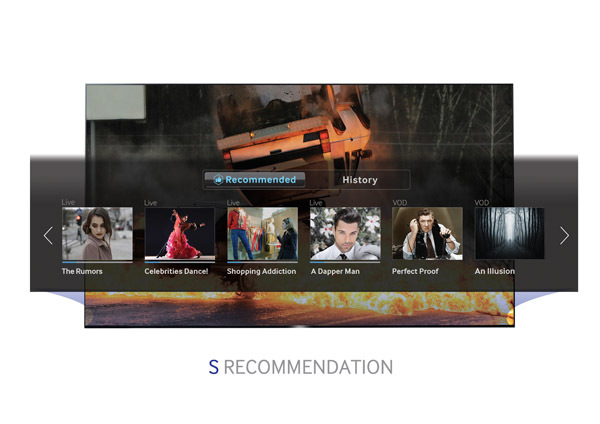 Based on your previous viewings, user ratings and what’s popular, S Recommendation provides a selection of customized suggestions for live TV, VOD or apps. This lets you spend less time searching and more time watching. 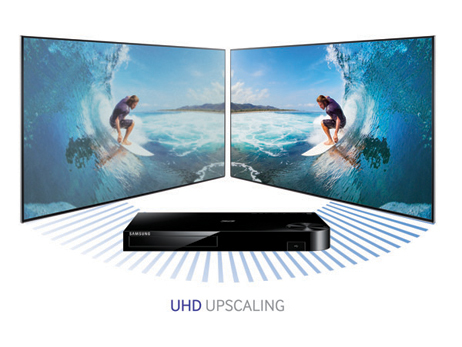 Experience jaw-dropping Full HD reality in both 2D and 3D. * Enjoy the latest Hollywood 3D titles and watch as your favorite characters practically leap off the screen when you pair this Blu-ray™ player with a 3D TV* and Samsung active 3D glasses. 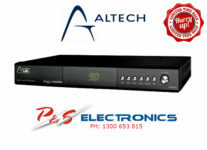 *3D TV, active 3D glasses and 3D content required. 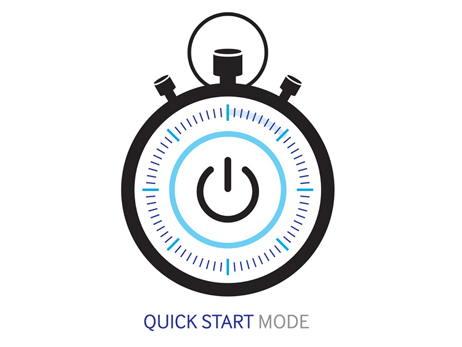 Your Smart Blu-ray™ player is ready when you are in as little as 0.5 seconds. 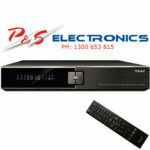 Most other Blu-ray players take up to 10 seconds. Stop waiting and start watching. 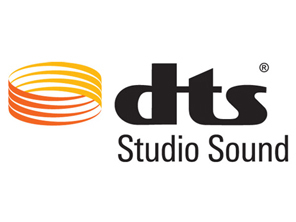 Processes standard 2-channel stereo audio tracks to deliver a full range surround sound effect with enhanced bass and dialog clarity. 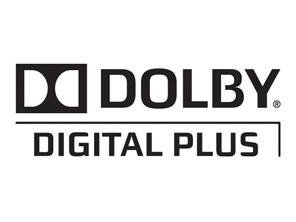 Decodes DTS-encoded content, such as TV shows, Blu-ray™ movies and streaming media, and processes stereo content to deliver an optimized surround sound experience with enhanced bass response, clear dialog and consistent volume levels.